Who murdered Betty Bitchay at the quilt retreat? Was it Lotta Agression, Bitsey Pieces or another quild member? What a fun evening of laughter, food and suspense. The cast did a great job of portraying their characters as well as the audience members. It was not easy trying to figure out the murderer of Betty Bitchay who was laying on the floor with her prize quilt! Thanks Judy for planning the evening for us. Play written by Nancy Becker Riester. This Year's Raffle Quilt is sure to be Highly Sought After! Way to go ladies! This year's Raffle Quilt is awesome! Thanks to all of you for contributing such beautiful patriotic blocks. Tickets go on sale soon! I know I cannot wait to buy mine! 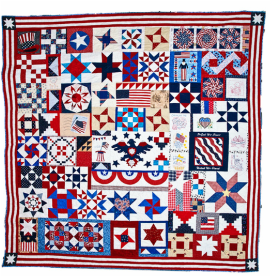 Be sure to share in the excitement of this quilt by volunteering to sell tickets at different events where we display the quilt. We need everyone to help. 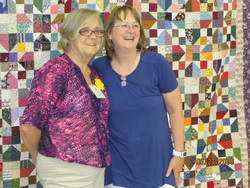 What a fabulous weekend of friends, fun, fabric scraps & QUILTING with Bonnie Hunter. Everyone learned so much! We love all of those great little tips and tricks we learned! Now we just have to get those quilts completed. We will be looking forward to seeing them soon. Be sure to check out Bonnie's videos of our workshops on her YouTube channel ( 1st 2 links) just click and then her post of our 2 sessions on Bonnie's Quiltville page on the last 2 links. As we celebrate our guild's upcoming Birthday of 10 years, it is also time to renew your membership. We love new members so be sure to invite a guest to come to one of our meetings to meet us and experience what a great quilt guild we are! If you are interested in joining our guild, please be aware that our dues are prorated after the first of the year. August 22 Birthday Party 10 years!